Blues fly-half Steven Shingler had a late penalty in front of the posts to grab a win, but having made all his kicks up to then send the last one wide. Tom James’ early try and Shingler’s boot had given the Blues a good chance. But Glasgow hit back with tries from Henry Pyrgos and Lee Jones, while Finn Russell aced all of his kicks. Russell’s conversion decreased the home side’s lead to 13-10 and a game that the Blues had considerable control over now hung in the balance at half-time. The home side’s efforts were at least rewarded with another Shingler penalty that pushed Blues back in front. With less than 15 minutes to go Blues were penalized for bringing down a scrum and Russell swung the favor back Glasgow’s side with the resulting kick at goal. Cuthbert and centre Rey Lee-Lo made some fruitful runs up field to give Blues field position as the clock ticked down. Within the last minute Glasgow was penalized for wheeling a scrum, giving Shingler the chance to claim victory. The losing bonus point – Blues’ first point of the season – will seem little consolation to Danny Wilson’s side. 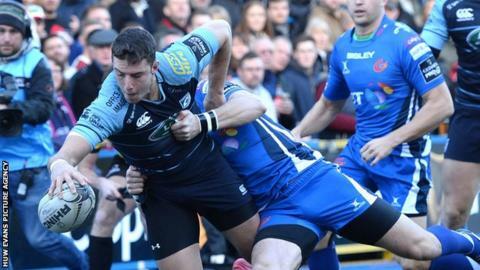 Cardiff Blues coach Danny Wilson told BBC Sport Wales: “It’s one of those things. I’m not going to be critical of Shings (Shingler), I think he kicked extremely well all night and unfortunately he’s missed that last one.